Forget running to the kitchen, enjoy the convenience of chilled beverages where they're needed most with our ENERGY STAR rated Danby Designer<sup></sup> compact all fridge. Boasting a generous capacity of 4.4 cu. ft. this counter high model is an efficient way to supplement your refrigerator. It includes our Canstor<sup></sup> beverage dispenser, reversible door hinge and interior light. Drawing inspiration from mid-century styling and simplicity, Danby's patented Contemporary Classic collection of compact refrigerators reimagine retro for the modern consumer. Featuring Danby's exclusive retro-inspired curved door design, metallic door and chassis finish, door lock, rubber-grip ergonomic chrome handle and stylized chrome worktop, its exterior features are only outmatched by its signature black interior. Drawing inspiration from mid-century styling and simplicity, Danbys patented Contemporary Classic collection of compact refrigerators reimagine retro for the modern consumer. Featuring Danbys exclusive retro-inspired curved door design, metallic door and chassis finish, door lock, rubber-grip ergonomic chrome handle and stylized chrome worktop, its exterior features are only outmatched by its signature black interior. Designer 4.4 cu. ft. Compact Refrigerator - ENERGY STAR® Forget running to the kitchen, enjoy the convenience of chilled beverages where they're needed most with our ENERGY STAR rated Danby Designer<sup></sup> compact all fridge. Boasting a generous capacity of 4.4 cu. ft. this counter high model is an efficient way to supplement your refrigerator. It includes our Canstor<sup></sup> beverage dispenser, reversible door hinge and interior light. Designer 4.4 cu. ft. 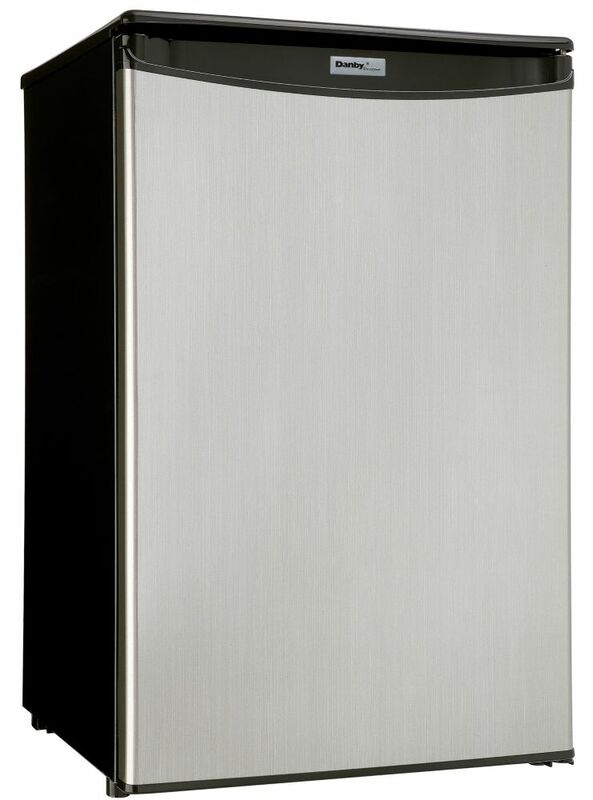 Compact Refrigerator - ENERGY STAR® is rated 4.2 out of 5 by 31. Rated 5 out of 5 by Country gal from Excellent little fridge Great little fridge. Works great and fits perfectly in the space I wanted it. Rated 4 out of 5 by AshJ from Very nice fridge Bought the fridge for our store's break room - looks great! The only downfall would be that it doesn't level properly. It only comes with one movable foot for adjusting, but it made it worse - it's more level after having removed it and placing a smaller folded piece of cardboard in it's place. Otherwise, great fridge. Rated 5 out of 5 by Happy customer from Great overall ! I ordered this one line, service was great -the delivery was very fast - and unit was installed all within four days! Runs very well. I have it installed outside (not manufacturers recommendation) in a covered area and it works exceptionally well - even on the hottest days ! I will take in over the winter though! Rated 5 out of 5 by Kathy G from Great small fridge. We now have two of these, and they are running fine. The best features are that they are all-fridge, and auto defrost. Lots more fridge space for the size, and no freezer that doesn't freeze. Rated 2 out of 5 by Joshua from Does the Job However I Expected More The bottom crisper might be better as just a shelf. It feels like a bucket sitting on the bottom shelf. Rated 4 out of 5 by Hubbie from Convenient Bought this as an extra fridge & it serves me purpose very well. Rated 5 out of 5 by SSN87 from Love it! I bought this for the purpose of keeping extra produce and stuff in for my baking, its perfect. Love the feature that it’s all fridge!! Hello Tweedy, The interior dimensions for this model are: Width: 16 11/16&quot;, Height: 28 1/16&quot;, Depth: 17 1/16&quot;. The compressor step is normally 4&quot; by 4&quot;.